This modern and spacious villa is wonderfully suited for groups of friends or families. It has been thoughtfully furnished and comprises four apartments, which each boast a living area. This very modern, spacious, bright and nicely furnished holiday home comprises four apartments, each with its own living room, dining room, bedroom and kitchen. 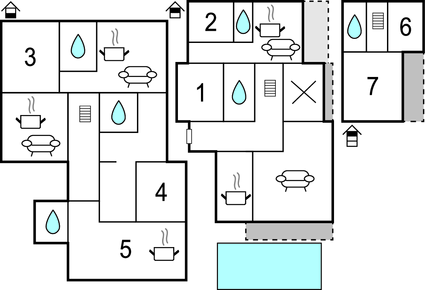 All rooms in the house are fitted out in a luxurious and modern way. They are also air-conditioned and therefore will be ideal for rest during the hot summer days. For romantic souls there is a whirlpool in the offer. All apartments are connected, while the one which is situated in the souterrain has its own private entrance. On the plot, there is a beautiful swimming pool, where guests can spend nice moments, swimming or just sunbathing by the pool. From the covered terrace, there is a beautiful sea view. The terrace can be used for evening socializing with delicious meals from the barbeque and glass of good wine. The whole plot is fenced and closed so guests, who wish to have their privacy, will surely be satisfied. In Pomer, where the house is located, there is a grocery shop, numerous restaurants with sea food specialties, ACI marina if you come with a boat and many beautiful beaches. Only 15-20 minutes of drive away, there is Premantura and the most southern part of Istian peninsula: cape Kamenjak – famous protected nature park with wonderful beaches and pine forests. This beautiful modern villa is made from brick or stone and was originally built in 2000 and refurbished in 2010. The agent has rated it as a five star property so it is one of their best villas - tastefully furnished and fully equipped. It is also great value for money. 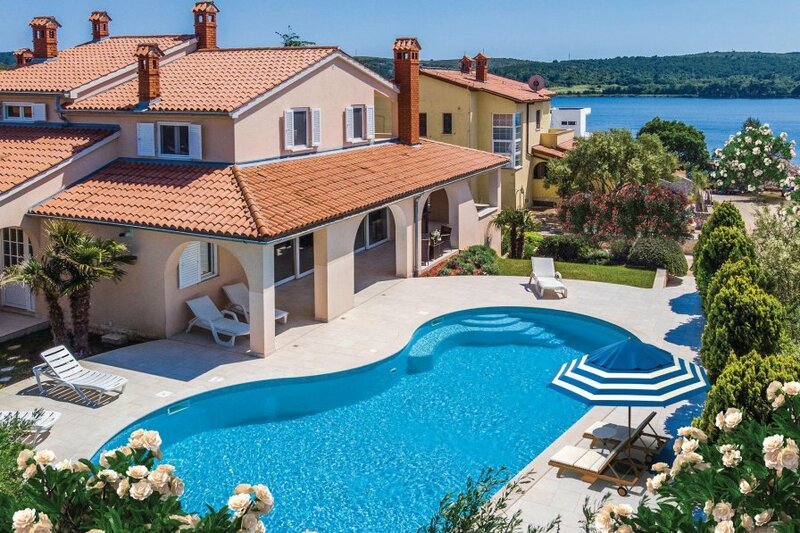 This villa has a swimming pool and sea view; it is also located in Pomer, only 8km from Pula. It is set in a very convenient location, just 700 metres away from a rock bound coast. There's also a restaurant only 300 metres away.